All celeb homes have these things in common. Like celebrities, their posh properties come in all shapes and sizes. Some are contemporary mansions overlooking the Pacific Ocean, while others are ski chalets with picturesque views of Aspen’s ski slopes. Although the homes of the rich and famous are designed differently, they tend to have similar elements in common like professional chef’s kitchens, breathtaking outdoor living areas, tall privacy walls, state-of-the-art security, fully equipped theaters and in-home gyms. And the more high-end the celebrity home, the more you’ll find custom features like wine cellars, car galleries, tennis courts, and even Botox rooms. Having worked in real estate for 15 years, Matthew Altman and his brother Josh Altman, who is the star of Bravo’s “Million Dollar Listing,” work with high net-worth individuals in Los Angeles’ entertainment industry (think actors, directors, athletes) to find exclusive properties in hot areas like Bel Air, Beverly Hills, Brentwood, Pacific Palisades, Newport Beach, and Laguna Beach. While The Altman Brothers buy and sell homes across the globe, aside from LA, their other real estate hubs include New York City, Miami, and Aspen—which also are popular cities for stars to purchase homes. We sat down to chat with The Altman Brothers to hear about the unique and amazing features that define the homes of VIPs. LA is a design destination with its array of unique residential architecture from mid-century modern dwellings like Rose McGowan’s mansion in Hollywood Hills to Mindy Kaling’s Spanish hacienda. Think sprawling open-concept homes with clean lines, floor-to-ceiling windows and the latest technology. Many of these modern homes include Fleetwood windows and Nanawall bifold doors that create a seamless transition from the inside to the outside. With LA’s temperate Mediterranean climate, outdoor living can be enjoyed year-round—and the great outdoors are just an extension of the home. It’s common for celebrities to use their patio spaces as living areas with large fire pits, cabanas, and fully equipped outdoor kitchens. Talk show host and comedian Chelsea Handler’s former Bel Air mansion embraced outdoor living with plenty of floor-to-ceiling windows and doors opening up to her lanai. With entertaining in mind, the backyard included a full bar, an abundance of seating areas surrounding the pool, and an outdoor living room with a large sectional and flatscreen television for movie-watching. “Charlie’s Angels” star Lucy Liu’s former 1950s Craftsman-style home in LA’s Studio City included a secluded garden-like outdoor living area, while actors like Ellen Pompeo of “Grey’s Anatomy” have properties with Italian-inspired terraced gardens and lush carpeted lawns. With outdoor living, naturally pools are an important feature on VIP properties across Southern California. For stars who have homes with dramatic views of the ocean or mountain vistas, infinity edge pools are popular, according to the Altman Brothers. And for family-friendly outdoor areas, Baja pools are a must-have so the kiddos have a shallow area to frolic. Lagoon-like pools like the one in Taylor Swift’s former LA home and Ellen Pompeo’s former Hollywood Hill’s home provide a tranquil oasis for celebs to get some R&R just right out their backdoor. Where else are stars going to stow all their red carpet looks? This $37.9 million Bel Air estate listed by The Altman Brothers includes his-and-her bathrooms with sprawling walk-in closets off the master suite. Beautifying for award nights at the Oscars and Emmys, stars need a place to get gussied up for their red carpet walk. The Altman Brothers note that some luxury LA properties include health spas and beauty rooms that even include a designated area for Botox injections, like you’d find at a doctor’s office. This $17.9 million modern mansion perched above Sunset Boulevard includes a full-on wellness center and salon for primping. Other celeb properties include fully equipped in-home gyms, like Nicole Kidman and Keith Urban’s workout center in their Nashville home. And in Mindy Kaling’s Beverly Grove home, she transformed the garage in her backyard into a room to pump iron. In modern homes, kitchens are the new family room — a place where friends and family hang out during gatherings. With people spending more time in the kitchen, modern LA homes are designed with entertaining in mind. These open-concept kitchens include sprawling bar areas with plenty of seating and easily flow into the other living areas of the house. High-end chef’s kitchens with top-of-the-line appliances have long been incorporated in celebrity homes. Ellen Pompeo’s old Whitley Heights home included an oversized kitchen with professional restaurant equipment like a six-burner range, along with a vast amount of prep space that you’d find in a catering kitchen. “Celebrities live in homes where they feel safe,” says Altman. “Security is the most important thing.” While most celebrities look to buy in gated communities where they are cloistered away from the hustle and bustle of Tinseltown, other stars buy homes throughout Southern California that have high privacy walls and gated driveways. Celebrity homes include high-tech security systems with cameras installed throughout the property. “Often when we sell a celebrity home, we send our AV-tech guys in to show them what they can do to make it more secure,” says Altman. Security technology is getting more and more affordable and can easily be connected to smartphones with security products like Nest and Ring. “Everything now is done from your phone from the lights to the cameras,” says Altman. Some celebrities prefer to bring in their own interior designer to fully outfit their new home with the latest home decor trends. For instance, actor Marisa Tomei hired designer Alexandra Hayden to deck out her former Greenwich Village apartment with an array of quirky and eclectic vintage furnishings. While many celebs put down roots in LA, they also purchase penthouses and condos in New York City. Most of the properties in LA are sprawling estates and mansions, while in the Big Apple vertical living is king. From SoHo to Brooklyn, stars are looking for NYC properties that are secure — a door person at the entrance of their condo or a private elevator leading to their penthouse. These high-rise properties also include just as many cool and unique amenities as mansions in LA. After getting engaged, Ariana Grande and Pete Davidson moved into architect Zaha Hadid’s visually striking condo overlooking the High Line in Chelsea. The $16 million condo has all the comforts of home — a private entrance, high-end kitchen, dressing room and fancy building amenities like an IMAX theater. Chrissy Teigen and John Legend’s new $9 million Nolita penthouse boasts a chef’s kitchen, two master suites with giant walk-in closets, and a private rooftop garden that is fully equipped for entertaining with a sound system and outdoor kitchen. Townhouses also are popular dwellings in The Empire City. 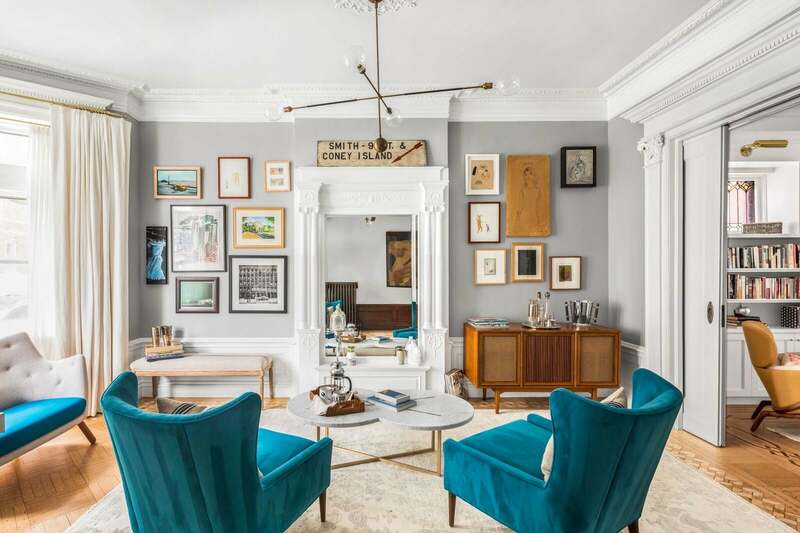 Earlier this year celeb couple Emily Blunt and John Krasinki sold their $6.56 million historic Park Slope townhouse. Built in 1909, the 5,200-square-foot home was updated with contemporary features like a chef’s kitchen and bright and airy skylights. The Altman Brothers also work in Miami and Aspen, as many celebrities look to own vacation houses in tiny resort towns. Aspen has long been a favorite ski destination for the rich and famous with stars like Goldie Hawn and Kurt Russell, Melanie Griffith, Jack Nicholson and Kevin Costner purchasing mountain chalets. And Miami is equally as popular for vacation homes, especially since Florida is one of the few states with no income tax. Stars like Lil Wayne, Pharrell, and LeBron James are big fans of the Sunshine State.